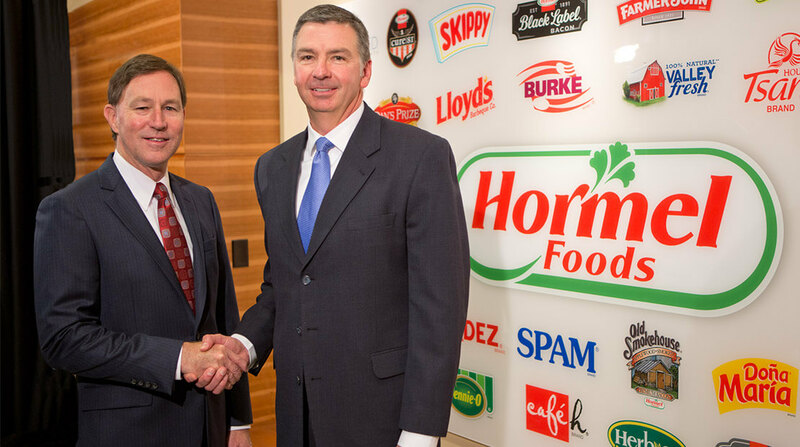 Hormel Foods Corporation (NYSE: HRL) announced today that its Board of Directors has elected James P. Snee to the position of president and chief operating officer effective October 26, 2015. Snee was also appointed to the Board of Directors. Snee succeeds Jeffrey M. Ettinger, 57, who has served as president since 2004. Ettinger will continue to serve as the company’s chairman and chief executive officer. In his new role, Snee, 48, will oversee all of the company’s business segments and global operations including Grocery Products, Refrigerated Foods, Specialty Foods, Jennie-O Turkey Store and International, and will continue to report to Ettinger. Corporate administrative functions including finance, mergers and acquisitions, legal, research and development, supply chain, and human resources will continue to report to Ettinger. Snee will be only the tenth president in the company’s nearly 125-year history. As group vice president of Hormel Foods and president of Hormel Foods International, Snee led the company’s International segment, which encompasses more than 50 countries outside the United States. Snee joined Hormel Foods in 1989 in the foodservice division and served in various positions within the group before being named manager of inventory and distribution for the Refrigerated Foods segment in 1995. He was promoted to foodservice area manager and foodservice regional sales manager in 1996 and 1998, respectively. Snee was named director of purchasing in 2006 and vice president of affiliated business units in 2008. In 2011, he advanced to senior vice president of Hormel Foods International and assumed his current position in 2012. Snee earned a Bachelor of Arts degree in marketing from New Mexico State University (Las Cruces, N.M.). He received his master’s degree in business administration from the University of St. Thomas in St. Paul, Minn.
Hormel names James Snee as new president Hormel Foods Corp. said Wednesday that one of its top executives, James Snee, will be promoted to president and chief operating officer. Hormel’s protein powerhouse: growth shaped through deals and new ideas Protein is in high demand from consumers, and the Austin, Minn.-based company specializes in it, from pork and turkey to peanut butter.